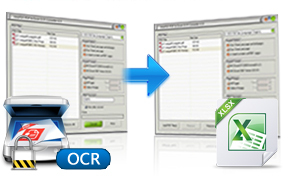 Convert scanned PDF to Excel by OCR. Convert password protected PDF to Excel. No need for other PDF applications. VeryPDF PDF to Excel OCR Converter is an innovative product that has been designed to help users convert scanned PDF to Excel files mainly. With its all capabilities, VeryPDF PDF to Excel OCR Converter can also convert common PDF to Excel. Moreover, this amazing software supports not only the batch conversion, but also the selection of page range with various languages. 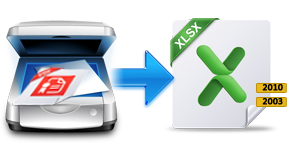 With its interface, VeryPDF PDF to Excel OCR Converter, under "Output Formats" tab, there are two radios of XLS and XLSX, which are the formats of MS Excel 2003 and 2010 accordingly, to click these radios separately could help you set the targeting file type as XLS or XLSX. VeryPDF PDF to Excel OCR Converter could convert specified page of PDF to Excel including common PDF and scanned PDF. To click the radio of "Select Range" could help users get the specified edit-boxes of "From" and "To", where users could input the page numbers to edit the specified pages for the conversion. With the edit-box of "PDF Password", VeryPDF PDF to Excel OCR Converter can help users convert encrypted PDF to Excel via OCR. To input user password of PDF files could make the converter convert encrypted PDF to Excel via OCR during the conversion. Convert each page of PDF into each sheet Excel accordingly. Convert all pages of PDF into one single sheet Excel. Convert scanned PDF to Excel in batches. Support drag and drop of PDF files. Support specifying the converting page range of PDF. Support preview Excel files automatically. Convert images to searchable textual PDF with Optical Character Recognition.